There may be no stronger ties to international issues than the military service of friends and family. The deployment of local National Guard units, being as connected to state and local communities as they are, offer particularly clear examples of how Maine is linked to global issues. This is the second of a series of articles drawing connections between these deployments to the news we hear today. In their first post-9/11 deployment, the Maine National Guard’s 133rd Engineer Battalion helped build and rebuild Iraq as the war geared up in 2004 and 2005. Eight years later, they helped deconstruct the U.S. military infrastructure in Afghanistan as the war wound down. Today we see a steady stream of news from the area of Iraq they worked in, as I wrote about in my first post on the unit. It is much the same with the unit’s deployment to Afghanistan. As headlines chronicle a resurgent Taliban, we can look back and find the 133rd’s mark on areas of the country still in the news. Few countries have had a worse forty years than Afghanistan. Since the Soviet invasion in 1979, Afghanistan has been at war almost continuously. Following the Soviet withdrawal in 1989, a brutal civil war ravaged the country throughout the 1990s. The conflict only slowed down when the Taliban consolidated power and replaced the violence of civil war with the violence of extremist theocracy. In 2001, when the Taliban refused to extradite Osama bin Laden and other al Qaeda members, the U.S. and U.K. invaded. Operation Enduring Freedom – Afghanistan began, and American and British forces swept from North to South, driving the Taliban into Afghanistan’s remote mountainous areas and Pakistan by December. In 2002 an interim government was set up under Hamid Karzai as the Taliban collected itself in hiding. In 2003 the Taliban launched an insurgency, and the stage was set for a new phase of Afghanistan’s long war. The insurgency would ebb and flow over the following ten years as the new Afghan government and international forces attempted to establish a secure hold on the country. The 133rd arrived on October 1st, 2013, twelve years after the invasion. The U.S., now as part of the International Security Assistance Force (ISAF), was preparing to end its combat mission. Map of Afghanistan with some of the 133rd’s areas of operations highlighted. Source: UN. Doing this work was not without risks. Only two weeks after the 133rd arrived, the Taliban launched rockets at Bagram, luckily inflicting no casualties (although the Taliban tried to claim otherwise). Bagram was far from the only base where this was an issue; one of the 133rd’s work areas was Forward Operating Base Shank in Gardez, nicknamed “rocket city”. Members of the Battalion heading to and from other bases in Afghanistan had their convoys attacked multiple times, but their vehicles were armored heavily enough for the small arms fire to not pose a serious threat. (Even those convoys that did not come under attack were still a stressful affair.) Fortunately, the 133rd sustained no casualties during the deployment, despite these attacks. The 133rd was in Afghanistan at an inflection point in the amount of violence, with lower ISAF casualty levels than during the troop surge in 2009-2012. Although the level of violence against civilians took a brief downturn in 2012 and 2013, it would start increasing again in 2014. The Battalion left Afghanistan on June 18th, 2014, and the U.S. officially ended its combat operation in Afghanistan on October 26th, 2014. There were many things the U.S. military still was and is doing—namely training and supporting Afghan security forces and running special operations missions against al Qaeda and ISIS—but the mission of actively fighting the Taliban ended. At its height following the 2009 surge, the ISAF force was over 130,000 strong in Afghanistan, and it is now down to 12,905. Afghan forces have struggled to maintain the tenuous security the ISAF had achieved in many parts of the country, where regions had been under constant threat of attack but few under Taliban control. In recent months the Taliban has taken hold of significant swaths of territory, as has ISIS in small parts near the Pakistani border. The Taliban now controls more territory than any point since the U.S. invasion in 2001. Click to see larger image. 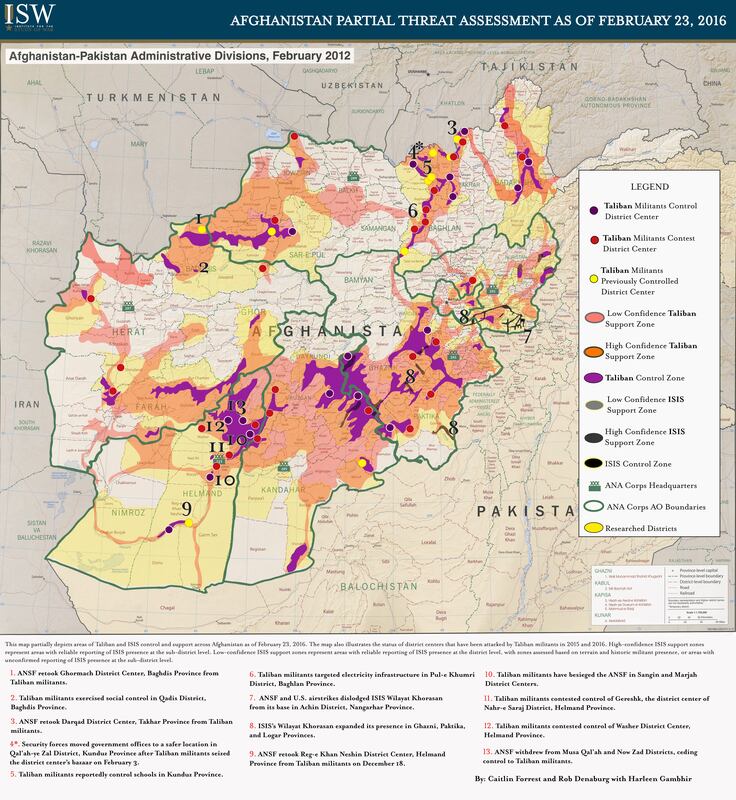 Purple areas are zones of Taliban control, and red and orange areas are zones that support the Taliban to varying degrees. Source: Institute for the Study of War. Long an area with a strong Taliban presence, the road between Kabul and Ghanzi that the 133rd’s convoys used to take fire on is still controlled in part by the Taliban, and Gahnzi itself is contested. The Ghanzi provincial police chief is worried that districts may soon fall entirely to the Taliban without reinforcements, as happened in the city of Kunduz and elsewhere in the country. Bagram Airfield, while not in a contested zone itself, has areas of strong Taliban support nearby and has continued to be attacked, most recently with a suicide bombing in December that killed six U.S. troops. The resurgence of the Taliban, while somewhat expected, has led President Obama to change the timeline for withdrawal once again. The U.S. will maintain 9,800 troops in Afghanistan through most of 2016 for training and counterterrorism missions and 5,500 for an indefinite period after that. How the insurgency will play out in the coming years is difficult to say. While they have never been monolithic, the anti-government forces may never have been more fractured than they are today. After the Taliban’s ruler, Mullah Omar, was revealed last summer to have been dead for two years, there was talk of the Taliban splitting after a crisis of succession. At least in some areas of Afghanistan, that seems to have happened, which will change the dynamic of the fight. The Taliban are also not the only active insurgents, with other players including Hezb-e-Islami, which has just announced intentions to join peace talks, and the Islamic State, which is actively fighting with the Taliban. There is also still an al Qaeda presence in the country. While terrorist groups like the Islamic State and al Qaeda are narrow enough to be dealt with militarily—and extreme enough to make it a necessity—there will almost certainly have to be a political negotiation process with the Taliban to resolve the conflict. Their support is too widespread at this point for them to be conclusively defeated through force, as it’s clear they never were. Unfortunately, they are refusing to participate in a round of peace talks initially scheduled to take place this month. The effect of the apparent splintering of the group on the potential success of peace talks is unclear; the Taliban’s weakened position could make them more likely to look for reconciliation, but infighting could also make implementation of any agreement more difficult. Furthermore, if Taliban leaders do agree to talks, hardliners may reject the stance and defect to even more extreme groups like the Islamic State. The war in Afghanistan has always been an untidy conflict, and its end has proven to be no different. The persistent insurgency has proved vexing to Obama’s longstanding promise to end the war, as it could clearly provide work for the U.S. military for decades. The decision to end the combat mission was one of the most contentious foreign policy issues of Obama’s presidency, and he received criticism both from the right for ending it too soon and from the left for lingering too long. But once the decision was made, it was Maine’s 133rd carrying it out. Soldiers from our own backyards were ultimately the ones on the front lines of U.S. foreign policy, as they always are. With Afghanistan still leading the news, the 133rd‘s history proves once again how stories on CNN and in the New York Times are never too far from the stories of your neighbors. Information on the 133rd’s deployment to Afghanistan was generously provided by 1st Lieutenant Jonathan Bratten, the Maine National Guard Command Historian and former historian of the 133rd. For those interested in learning more about the deployments of fellow Mainers, you can contact the Maine National Guard’s Public Affairs Office at 207-430-5759 or ng.me.mearng.list.public-affairs@mail.mil.